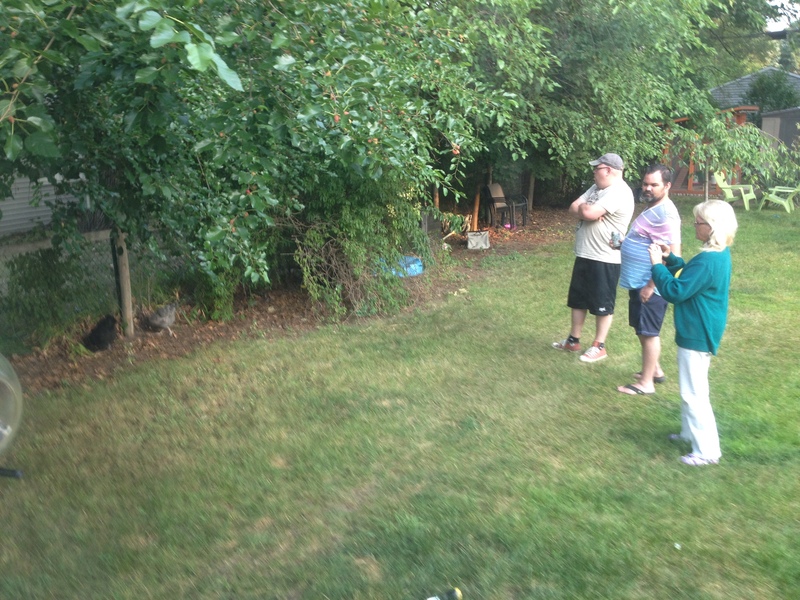 My family takes a break to look at the birds. A lot has gone down in the last few months. During the summer, I fell ill. Then when my brother came to visit me during my recuperation, he had a heart attack. Suddenly our house was filled with concerned house guests. And the chickens? They were a welcome distraction. We spent hours out in the yard, watching Nellie, Loretta and Gigi scratch under a bush, and chase bugs across the lawn. Their chicken antics brought smiles to our weary faces. 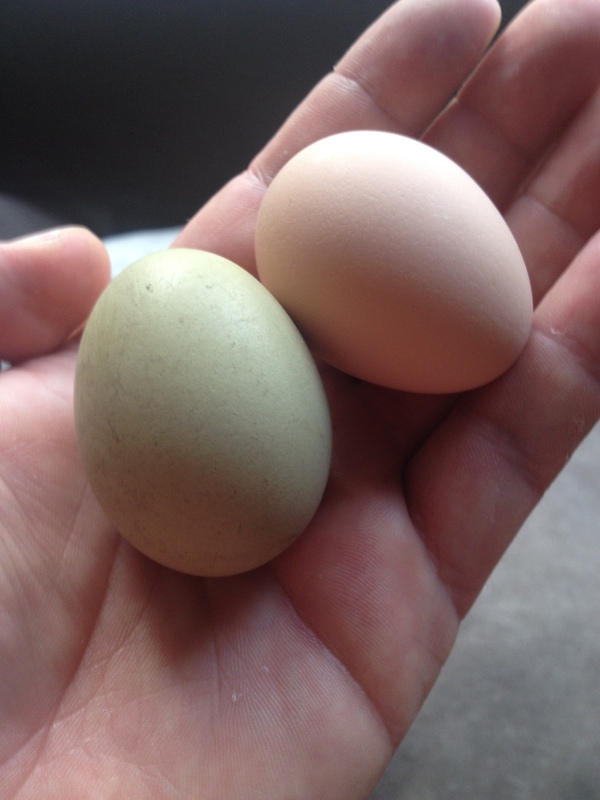 Our first green egg, plus a light brown one from Nellie. The week after everyone left, we got our first eggs. One each from Nellie and Loretta. 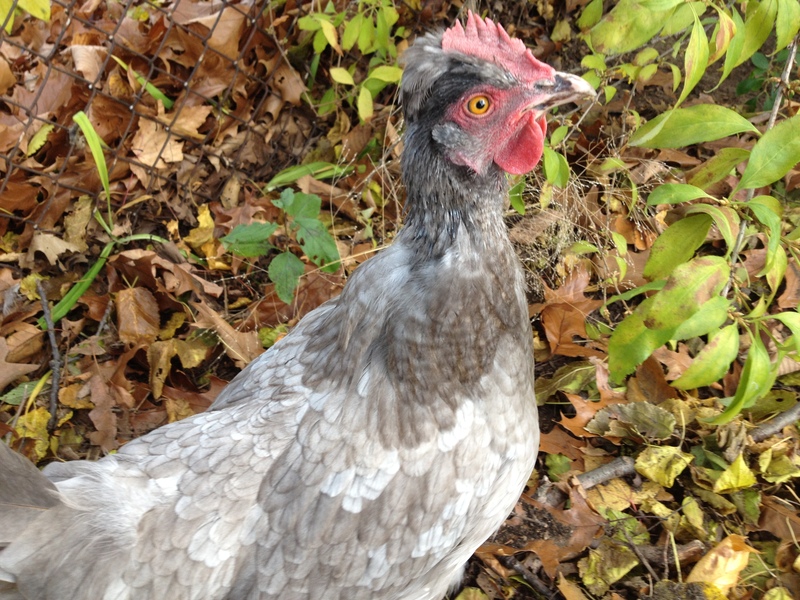 Nellie would go on to be a powerhouse chicken, providing one egg almost every day. In the months that followed, Loretta gave us just five. Gigi fell somewhere in the middle, offering 4-5 green eggs a week while she was laying. Another development: It ends up Nellie is one angry bird. She bites me at every opportunity, and has drawn blood on many occasions. If it wasn’t for her super-layer status, I’d be having her for dinner. The biggest development came when Matt was offered a job as an environmental attorney. The rub is that the dream job is about an hour and a half away. So for the meantime, Matt got a loft near his job, and we started fixing up our house in Ferndale. Our plan is to get it on the market soon, and to buy a farmhouse closer to Matt’s work. But what about the chickens? I hear you ask. It’s sort of tricky, but if we buy a home that doesn’t have a chicken coop, I have asked a good friend to foster our chickens until we are ready for them. The feathers on Gigi’s neck are thinning, and she’s got a bare spot on her lower back. And as the temperatures steadily drop into the 30s, two of our chickens decided to molt. The inside of the run is filled with their feathers, and Gigi and Loretta have bare necks. I feel bad that they are losing their feathers as we head into cold weather, but such is the nature of things. I’ve read that chickens fare much better in the cold, compared to hot weather … and from what I can tell that assessment is completely correct. One more thing about molting: no eggs during this time. Except from Nellie. That angry lil’ bird still has all her feathers and is focused on pumping out an egg a day. It’s been a busy few months, from health scares to triumphs. And we anxiously look forward to what’s coming next.